So let me get this straight…..you want me to grab my ski gear, put on the brand spanking new Fernie Lodging Company jacket and hit the slopes to schmooze…and get paid to do it? START THE CAR!!!!! Seriously! With over 56cms of champagne powder falling on our magnificent mountain over the last 48 hours and over 143cms in the last 7 days…..don’t have to ask me twice…..colour me gone! Buh-bye! Best office job ever!! From the King Fir Lodge at Timberline Lodges where our office is located I had an easy 12 minute walk to the lifts (I could have taken the shuttle but I wanted to limber up)…then decision time…head to the Elk Chair to hoot and holler through Cedar and Lizard Bowls or venture up the Timber… head for Currie Bowl to witness a little of the infamous ‘currie carnage’ when it first opens or go above and beyond to the Polar Peak Chair! You know what? Any decision is a good decision on a powder day…and trust me…what a powder day!! As I skied off the Elk and made my way down to the Boomerang, I hit my first fresh tracks of the day….woohoo!!! Once comfortably seated and rising, all I could hear were euphoric shrieks, screams of sheer delight and I even heard a little yodelling echoing through the trees and bouncing off the mighty Lizard Range!! As I traversed into Cedar Bowl my adrenalin started revving up…look at all this freaking snow!! Where is everybody? I have this bowl to myself! Are you kidding me? Then I dropped in and landed on a pillow of the most incredible champagne powder I have ever been in! Deep, deep blower pow!! Faceshot after faceshot….even choked a couple of times and I now understand the whole snorkel thing! 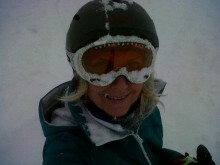 I have never skied in such deep snow and the elation I felt and still feel are beyond comprehension! Pre-Christmas skiing at its best!! Thank you Griz!! Another incredible experience here in the Elk Valley can be found at Island Lake Lodge where catskiing is second to none! With over 170cms in the last 5 days the conditions are epic! They still have availability this winter so don’t delay – call today! In fact, here’s what I would do if I were you. Give me a call and book into one of our cozy on mountain log cabins or luxurious condo suites, get your legs warmed up on the slopes of Fernie Alpine Resort, soak in your private hot tub and sip on some bubbly in the evenings and then head to Island Lake to enjoy the 2, 3 or 4 day tour you just booked…you did call, right? You will have enjoyed the best of both worlds here in Fernie! You may never want to leave! I feel so blessed to live in this beautiful valley, being in the same town as my amazing sister Sue, a hop, skip and a jump away from my kids in Calgary and surrounded by so many good and special friends. This is definitely where I belong. I want to take this opportunity to wish you all a very Merry Christmas and the happiest of New Years. Oh…and if you would like to get me a gift…let me make your winter vacation dreams come true….that’s really all want…I simply love my job! 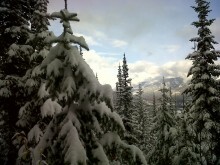 Ski Season in Fernie BC Has Begun!! That’s right…..ski season has finally arrived and I made it official by hitting the slopes at Fernie Alpine Resort on Sunday…it was so much fun! Now granted, there were only 4 lifts open, but I made sure I hit every one of them at least twice. It was snowing like crazy and every run was better and better! Although I did lots of biking, hiking and running over the summer my legs began to protest and I suddenly heard something calling my name….what was it?? Aha! The Griz Bar summoning me to my first delicious Mogul Smoker of the season – and boy was it good!! Now that’s how to start the season! The bar was filled with locals donning big smiles…and not just from the après ski libations! Getting out into the great outdoors doing what we love to do makes us Fernie folk very happy! That’s why we live in this little piece of heaven and even more reason for you to come and visit us…we could probably write the book on Smiling 101! As the snow continues to fall, the lifts and runs will continue to open and this season will snowball into yet another epic Fernie blower snow kinda season! As a matter of fact as I sit here at my computer my windows are rattling from the bombs a’blowin’! The Patrollers are in full swing ensuring that you stay safe! Are ya with me? Well then you’d best be booking your accommodation sooner than later! You don’t want to miss out on staying in one of our ski in/ski out cozy log cabins or one of our luxury condo suites…both with private hot tubs! You can always bring the whole gang and settle into one of our resort homes. So…no excuses…pack up the car, the kids, the significant other….even bring along Grandma to babysit or book your kids into the daycare…but for goodness sakes…don’t delay! We’ve got some great specials in place….check them out! • STANDARD BOOKING TERMS AND CONDITIONS APPLY. • CANNOT BE COMBINED WITH ANY OTHER SPECIALS. Call now and speak to one of our friendly, knowledgeable vacation specialists (yes, I am one of them) and book your holiday today! https://www.fernielodgingco.com/wp-content/uploads/2013/04/logo_white.png 0 0 Vacation Login https://www.fernielodgingco.com/wp-content/uploads/2013/04/logo_white.png Vacation Login2012-12-04 21:24:422014-07-03 21:26:04Ski Season in Fernie BC Has Begun!! Fernie BC…Where All The Action Is! Okay I have tried to sit down and write a new post for 3 weeks now….but I’ve been busy studying for my Masters in…and if you believe that, I have a piece of property in…oh dear…I digress….truth is I just couldn’t decide what to write about! Fernie is the coolest town to live in and every time I turn around, there is yet another fun thing to do! From concerts at the Arts Station, Film Festivals at the Community Centre to Ghostrider Hockey Games at the Fernie Memorial Arena there is just never a dull moment! Opening weekend at Fernie Alpine Resort is fast approaching and let me tell you….that gets me SO excited! I am marking off the days on my calendar…the countdown has begun….December 1 is the big day! Let the bells ring out and the banners fly! Before you know it, you’ll be hootin’ and hollerin’ down Linda’s Run, Currie Powder or Stag Leap on that pristine champagne powder day! Pumped yet? Well you should be….we anticipate another epic snow year and the best news of all is that I have commenced my Snow Dancing as of Nov 1, so let the flakes fly! Speaking of flying, heli skiing isn’t the only non lift assisted skiing and snowboarding to partake in…how ‘bout some catskiing? No matter what the weather, you can all ski/snowboard together and Island Lake is the place to go. 2013 is their 25th Anniversary and in conjunction with that they are releasing an illustrated history book of Island Lake and the Cedar Valley in about 4 weeks time. So have you booked your Christmas vacation in Fernie yet? We still have some availability in our Polar Peak Lodges, Snow Creek Lodge, Bear Paw Lodge and Timberline Lodge. Things are filling up quickly so don’t delay! If you do come for Christmas, please ask at the time of booking about our add-on Christmas Package consisting of a 6 foot pre-lit Christmas Tree, a tree skirt, ornaments, tree topper and the best thing of all…my ‘world famous’ homemade shortbread cookies! If you’re coming to Fernie ahead of the hustle bustle of Christmas, we have a few deals for you! Stay and Ski early this winter….3rd night half price for check-ins up to Dec 21 on all properties and no blackout dates or book 3 nights and get the 4th FREE at The Timbers or River Rock Lodge!! https://www.fernielodgingco.com/wp-content/uploads/2013/04/logo_white.png 0 0 Vacation Login https://www.fernielodgingco.com/wp-content/uploads/2013/04/logo_white.png Vacation Login2012-11-02 21:22:422014-11-10 14:08:13Fernie BC...Where All The Action Is! I know I know….I did not post last week….shame on me! But seriously…the weather has been so amazing that I just couldn’t bring myself to sit inside and stare at a computer screen! The sun has been a brilliant orb of yellow in the azure sky and its rays have been dancing upon the gold, orange and red of the autumn leaves and when it sets, the vibrant colours literally take your breath away. The majestic mountain peaks have been powdered with white a little bit here and there but they still host the lush green of the mighty conifers as they effortlessly slope into the Elk Valley. Now don’t you fret…..Mother Nature will be delivering winter to us soon enough, but this is the time of year to enjoy the great outdoors and reflect on the many reasons why we all ended up here. There is still time after work to go for a run, a bike ride…and the weekends are still prime for that big hike you’ve been putting off and according to the locals, the fishin’ ain’t half bad either. I am so in love with Fernie that it still puzzles me as to why it took me so long to move here but no need to dwell on that cuz I’m here now and that’s all that matters! Speaking of all this beautiful weather, it is the perfect opportunity to start your outdoor fitness regime in preparation for the epic ski season that is just around the corner. Hiking! Up the trail is a great way to work on those calf muscles and your cardio. Soon you won’t have to search for your lung on the way down – you’ll only be conscious of the quad workout which simply can’t be beat. I remember after my first big hike last year I might as well have taken a sledge hammer to my quads the next day…ouch…but it was a good pain! Always remember that…the stellar shape your legs are in on your first day down Concussion or Papa Bear is so rewarding and well worth the après hike pain. Why not turn it into a full body workout? Make the trail into your own personal boot camp….find a tree to do upright push-ups against or use the railings on a bridge; when the trail is flat I want to see lunges, lunges and more lunges and when you stop for lunch, stomach crunches pre and post food will help you on your way to that 6-pack you’ve dreamed of! Hiking can be social, fun and where else can you have such spectacular views when you’re working out? So here’s the deal…head to Fernie and take advantage of one of our great summer/fall specials valid until November 30. Go for a hike, swim some laps in our heated outdoor pool, book a treatment at our King Fir Spa and then soak in your private hot tub. All our vacation properties have fully equipped kitchens for you to cook up your own gourmet meal or head out to downtown historic Fernie only 10 minutes away and treat yourself to a delightful dining experience at one of our many excellent pubs or restaurants. I insist! November 1 is typically when I commence my snow dancing and trust me – that in itself is one heck of a workout! Try it…you’ll like it! When the snow flies fast and furious you can give yourself a pat on the back and say to yourself, “Job well done”! Book your winter ski holiday prior to October 31 and receive a great discount! We can create the perfect getaway for you…resort homes, log cabins, chalets, lodges and condo suites…you name it, we’ve got it! Well that’s a mouthful and a half….wasn’t really sure how to word it but there you have it…..we have a fishing paradise here in Fernie and men, women and children come from all over the world to test our waters. Fish stories are exchanged daily over mugs of steaming lattés and cappuccinos….about the one that got away…it was how big?? Now in all fairness, I am not a seasoned fisherwoman…..in fact I can’t quite recall my last fishing expedition but I’m sure it involved dragging the bottom of a lake, yards of tangled fishing line and expletives not fit to post. I know, I know….I need to at least give it a go now that I live here! My son is heading out this way on the weekend to do some fishing and he invited me to go with him…I told him I’d sit on the shore and read a book….and cheer when he reels in the big one! Such a good Mum!! The weather is ideal right now for fishing…the days are still warm and sunny and although the nights are cooler, fall fishing is fantastic! I’ve even noticed some new hatches of little flying creatures stuck in my teeth when I’m out for a run by the river…I’m sure they have some name like Baitis or October Caddis. You can venture out on your own, but to find that perfect deep pool or sweet foam line, you’d be best to take a guided fishing adventure with one of our experienced and professional guiding companies. You can choose from Fernie Fly Fishing, Kootenay Fly Shop and Guiding Co., Elk River Guiding Company or Fernie Wilderness Adventures – they can all provide you with one of your most memorable fishing expeditions ever and help you reel in the big one that didn’t get away! Now after a day on the river wrestling with “Fishzilla”, you’ll probably want to rest those tired, aching muscles. Why not book a spa treatment at our very own King Fir Spa. Choose a Restorative & Relaxing Classic Massage or a Sports Massage or any one of the wonderful services we offer. Then check in to one of our cozy log cabins or condo suites with your own private hot tub and soak the night away. We still have some great summer accommodation specials – don’t miss out! So as summer continues to grace our valley with all it’s splendor, the leaves are starting to turn and before we know it the snow will fly! Christmas and New Year’s are not that far away. Book today! What are you waiting for? If you visit us for a Fernie Christmas, don’t forget to ask about our Christmas Package including a tree, ornaments, tree topper, tree skirt and the best thing of all….some of my world famous shortbread cookies! Why on earth I am thinking about December is beyond me! I mean really…we still have blue skies, sunshine, trails to explore, golf to play and fish to catch! I suppose that with the colder nights, one can’t help but start to dream about snow capped mountains, face shots and Mogul Smokers at the Griz Bar! I awoke with a start yesterday morning as I heard a strange roaring noise coming from below my bedroom…sounded like the train had taken a wrong turn and was detouring through the house or at the very least the trolls that live under the house were coming to take me away! I pulled the covers tightly over my head awaiting the worst when it occurred to me that the whole train thing was quite ridiculous and trolls were only supernatural beings in Norse mythology and Scandinavian folklore. What the….oh wait…..the furnace….the furnace? Oh no! That means it’s likely frosty outside! Frost? Ah! Sue’s garden! I’m house sitting for her and I promised to take care of her prized, world famous tomatoes! I shot out of bed, threw on what I thought was my housecoat (turns out it was the rug that was beside my bed) and dashed out to the moonlit garden still somewhat wary of the trolls. I gathered those tomatoes in record time and returned to the house. Whew! Disaster diverted! 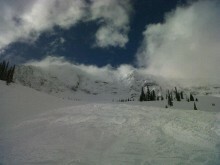 So yes, the nights have caused many Fernie furnaces to leap to life, but the days are still so beautiful! The leaves are begrudgingly starting to turn to some yellows and oranges and a few are even starting to drift from the branches when a breeze sneaks up and tickles them. Now I’m still not going to do any snow dancing because I have a few items on my bucket list to get through before that first blanket of white, but there’s nothing wrong with dreaming about a White Christmas! Speaking of Christmas, have you booked your holiday to Fernie yet? Well, I suggest you get on it! We have some cozy condos, chalets and lodges available….fireplaces, private hot tubs and fully equipped kitchens with ovens big enough to roast that turkey in. We even have a Christmas Package available as an add-on when you book your accommodation including a pre-lit Christmas Tree, ornaments, tree topper, tree skirt and even a box of my homemade Christmas cookies. Let us take care of your vacation – it’s what we do! We’ll make your Fernie dreams come true. 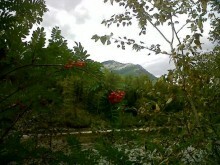 Don’t Say “There’s Always Next Summer”…..It’s Still Summer in Fernie BC! It seems once Labour Day Weekend has come and gone and the kids are back in school, everyone is of the same mind…..summer is over…sigh….but wait!! It is absolutely not over! For starters, the first day of Fall is September 22 and at my tally, that’s 17 days away! So lift that chin up….way up….and have a look at what awaits you! Open your eyes and mind to the endless activities that Fernie has to offer! Whether you want to hike our beautiful trails, mountain bike our well maintained single tracks, swing your clubs at our immaculately manicured golf course or fish in our pristine river…there’s still lots of time! As I mentioned last week, the dog days of summer are still with us. Yes the evenings are cooler but the stars still dance merrily above us and the moon shines down on us in brilliant splendour. Speaking of the moon…were you able to view the Blue Moon over the weekend? Did you sleep under it? No? Well I did!! Yup….Saturday night my friend and I slept out on his deck under the twinkling stars and the brightest moon I’ve ever seen. I almost had to wear my sunglasses to catch a few z’s! When I finally stopped star gazing and drifted off, I had the deepest, most peaceful sleep ever and as the morning sun bathed me in its warmth it put a smile on my face and a song in my heart….oh wow that sounded sappy…you get the idea…it was awesome! There are also some great events yet to come this month….Fernie Terry Fox Run, Tears and Gears Mountain Duathlon,Fernie Kids Tri and the Emily Brydon Youth Foundation Golf Tournament. There are concerts at the Arts Station and live music at the Brick House. So you see? Still time to enjoy Fernie before donning the down jackets, toques, gloves and winter boots. We have September Savings or Summer Savings on all our vacation properties. So yes, I am dwelling on summer, but it’s a fact that winter will be along with a vengeance before we know it! Not quite time to start our snow dancing but have you booked your winter wonderland getaway yet? What? No? Well, check out our Book Early and Save This Winter or our Winter Long Stay Specials and picture yourself curled up in front of a cozy fire in a condo suite, chalet, lodge, log cabin or resort home. Don’t miss out on making this your best winter yet! Let us make your Fernie dreams come true. https://www.fernielodgingco.com/wp-content/uploads/2013/04/logo_white.png 0 0 Vacation Login https://www.fernielodgingco.com/wp-content/uploads/2013/04/logo_white.png Vacation Login2012-09-05 21:14:532015-10-13 09:32:52Don’t Say “There’s Always Next Summer”…..It’s Still Summer in Fernie BC! Well, we are managing to cling to summer here in Fernie! The forecast for the next 14 days is nothing but sunshine and blue skies! Sure the evenings are cooler, but the weather during the day is so fantastic for hiking, biking and golfing! I’m sure there are trails you’ve yet to try and perhaps you’ve not hit the links yet…..now’s the time! Don’t delay! Last night as I wandered home from the final Wednesday Night Summer Social I was absolutely blown away by the sunset! 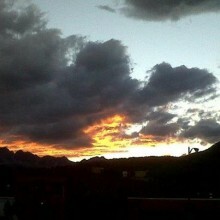 It looked like the entire western skyline was on fire! It literally took my breath away and I found myself speechless which, for those of you that know me, is extremely rare. I marvel at the raw beauty of this special place we call home…the mountains, the trees and the eerie yet magical shadows cast by the full moons. Speaking of which, tomorrow night is a Blue Moon! You’re familiar with the old phrase “…once in a Blue Moon…”? This is where it comes from…it will be the second full moon in a month! And the next one won’t happen until 2015 so I think we all need to sleep outside tomorrow night on top of a mountain! Well, that’s what I would love to do….how amazing would that be? I’m sure I could reach out and touch the moon! Okay perhaps that’s a little ambitious, but I hope you all have a chance to experience the extra-special energies and messages Blue Moons are fabled to give us! Come to Fernie this weekend and let us share our mountain life with you! We have some great last minute lodging specials and there are some fun events going on throughout the valley including the Demolition Derby, the last weekend of summer operations at Fernie Alpine Resort and the final Sunday Mountain Market. Head up to Island Lake Lodge for a hike and lunch on the Bear Lodge deck (lunch not available on Saturday due to a wedding) or hit their Date Night on Monday night and dine on the best food I’ve ever been lucky enough to savour. This night has become so popular it’s best to make a reservation. So yes, as much as I love these dog days of summer, I can’t help but start to dream of the morning light dancing across my window panes with webs of snow drifting gently across them….oh champagne powder…soon….very soon. Book your winter Fernie, BC getaway now and take advantage of our great early bird specials! Well, with all this nice warm weather we’ve been having, I have been somewhat remiss in my postings…my bad….but seriously I would much rather be out hiking, biking, golfing or floating the river in all this glorious sunshine than glued to my computer writing about why you should come to visit! Speaking of floating the river, I finally managed to do my first river float of the summer on Monday afternoon after work with my sister and brother-in-law. Now, as I have mentioned, doing anything with my sister is always an adventure and this was no exception. She offered me one of their flotation devices to use….little did I know it was the Low Rider when I accepted. Granted it has a beverage holder, but I will tell you it is aptly named as your derriere sits very low in the water! As I looked over to see what Sue and Eric were floating on, there they were…..riding on lovely proper river floating tubes with very high clearance…..of course they were! Now aside from the fact that the river is um…er….extremely refreshing, it has also become quite shallow in places and I found myself on a number of occasions, high centered on some very pointy rocks while the other 2 sailed merrily onwards. So take it from someone who is still thawing out and nursing a few unsightly bruises….don’t float the river in a Low Rider!! Riding on the proper apparatus, the river is a blast with some really fun rapids so enjoy it while summer is still here! Something else really fun to attend are the Sunday Mountain Markets Every Sunday through until Labour Day from 10am – 2pm at Rotary Park you can check out farmer’s just picked fruit, organic veggies, herbs and flowers; herbalist’s hand-crafted soaps and fragrances; baker’s tasty pies, bagels, cupcakes and sourdough bread; as well as local artisan’s latest creations. The Wednesday Night Socials downtown at Station Square are my favorite with live music, delicious food and a beverage garden but sadly the last one is August 29. So…have you tried the Aerial Playground and Rippin’ Zipline at Fernie Alpine Resort? No?? Well get on it! This is hugely fun for all ages! Why not make a day of it? Book your time in the Aerial Playground, then hop on the Timber Chair for a scenic ride up the mountain. If it’s a weekend or holiday, you can stop in at Lost Boys Café for lunch for their Ride & Dine Special. There are some great hiking trails once you’re up there as well….Polar Peak is one of my favorite hikes reaching an elevation of 7010 feet and a view of the Elk Valley that is simply breathtaking. There’s only one more long weekend this summer and we want you to enjoy Fernie so we are offering the deal of a lifetime!The Timbers is available and the special rates are so amazing I can barely contain myself! Gather your friends or family…up to 17 of you can stay in this executive mountain-style log home. Give us a call to book your September Long Weekendgetaway! Speaking of specials, check out our Early Winter Booking deals and Long Stay Specials. Don’t miss out on an opportunity to settle into one of our cozy cabins, condos, chalets or resort homes. 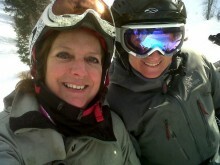 Fernie BC…The Best Place For a Bucket List! 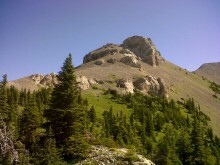 Well, one Bucket List item less…I finally hiked Mountain Lakes Trail (Heiko’s Trail)! Yup….sure did! What an amazing experience! They say pictures say a thousand words but honestly no picture can paint that scenery. It took us 8 hours, with a couple of stops for snacks and lunch, but all in all…a great workout! We didn’t have any bear encounters (whew) but did see a few mountain goats, some picas, a deer and a Clark’s Nutcracker soared above us as we gobbled down our lunch. With not a cloud in the sky, the seven of us, including my sister Sue whom we’ve nicknamed Miss Adventure (and that is another story for another time! ), trekked our way to our destination – the Bear Lodge deck at Island Lake where we were treated to probably one of the most refreshing, coldest beers ever served! What a fantastic way to end a stellar day spent with good friends and family. Just as an aside, I would call Island Lake to ensure they’re open to the public the day you’re hiking as they are host to weddings throughout the summer, mainly on Saturdays, and it would be a shame for you not to experience that great deck at the Bear Lodge! So…what’s on your Bucket List? Floating the Elk River? White water rafting? Mountain biking Project 9 or Swine Flu? Hiking the Three Sisters? Zip lining? Skiing double black diamond runs? (had to throw winter in there) Oh….the possibilities are endless! This is such a diverse and grand playground we have here that I’m not sure if there are enough years for me to fulfill my list. Then of course there are all the events coming up, especially this weekend. 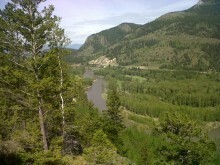 The 2012 Highline 100 is on Saturday August 11th. It’s a fun bicycle ride, not a race, where you have your choice of doing either 100 miles (160km) or 100km road ride. The reason for this ride is to carefully grow it into a meaningful fund raiser for the Elk Valley Hospital Foundation and the Fernie Alpine Ski Team. The Wapiti Music Festival kicks off Friday August 10th and continues on Saturday August 11th. The focus is fresh Canadian Indie music, full of energy and fun for all ages. Sunday August 12th is BibBity BobBity Boo – Fernie’s Children’s Festival at Rotary Park. This is serious fun and you won’t want to miss this! Check out our Events Calendar for more excitement later in the month. Come visit Fernie for the whole weekend! Call us and mention any of the above events and get 10% off a 2 night stay or 15% off a 3 night stay. We also have long stay special on all our accommodations including our lodges, condos, log cabins and resort homes so pick up the phone and talk to one of our reservation specialists (that includes me) and find out more information!! Whether your Bucket List is an adrenalin activity, an event or a romantic getaway with that someone special, Fernie BC is the best place in the world to start! Fernie – the place where dreams come true! https://www.fernielodgingco.com/wp-content/uploads/2013/04/logo_white.png 0 0 Vacation Login https://www.fernielodgingco.com/wp-content/uploads/2013/04/logo_white.png Vacation Login2012-08-08 21:10:162014-11-10 14:02:49Fernie BC…The Best Place For a Bucket List!